This no obligation evaluation will help determine your current health status and your need for chiropractic treatment. We want you to trust that we understand your concerns while extending hope that we can be of service in providing your care. During your second visit to the office we will present a report of findings, which will include the results of your testing. This will allow us to pinpoint where your health is today and make it possible to come up with a very clear game plan. We will advise you as to how long it will take to overcome your health challenge, the frequency of chiropractic care necessary and all of the costs involved. We want you to have all the facts so that you can make the best decision for your family! New Patient Orientation Classes: We encourage you to bring your spouse for this in-depth workshop on chiropractic. We want you to feel supported on your journey back to health, and this is one of the best ways to do so. Stretching Classes: We offer these workshops for all levels of ability, and encourage attendance so that you can benefit from proper stretching techniques. Through ongoing education, we want to encourage our patients to see the connection between lifestyle habits and how they feel and function! Here’s a common analogy to help you understand how chiropractic works, using orthodontics as an example. When you visit the orthodontist, that orthodontist takes X-rays of your teeth, designs a mold and then tells you how bad or good your occlusion (bite) is. The orthodontist then makes recommendations as to how long it will take to correct your bite. Chiropractors basically do the same thing. We evaluate, take X-rays, locate spinal misalignments and recommend a program to correct the problem. The first phase of chiropractic care is to repair and restore, which is the basis for all future work. The second phase is the opportunity to continue to choose wellness once you’re there, which is accomplished through periodic adjustment, even in the absence of a symptom or pain. 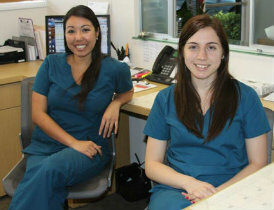 Our patients love our warm and welcoming office! Contact us today to experience our state-of-the-art evaluations!